Mix the yeast and sugar. Add 150ml of the warm milk and water. Stir and leave for 20-30 minutes until frothy. Grease three baking trays. Add the salt and spices. Add the yeast mix to the dry ingredients with the remaining milk and water. Mix to a dough and knead on a floured board for about 10 minutes until smooth, gradually incorporating the dried fruit and peel as you do so. Put the dough in an oiled bowl, cover and leave in a warm place until doubled in size - about 1½ hours. Knead again briefly to knock out the gasses. Divide the dough into three and cut each into six. Form each piece into a bun and put on the prepared trays. Cover and leave in a warm place for 30 minutes until almost doubled in size. Meanwhile, preheat the oven to 200°C/gas 6. Mix the 2 tbsp sugar with 2 tbsp water and set aside. Make a paste with the 75g flour and 3 tbsp water. Roll out to about 18cm square and cut into narrow strips for the crosses. 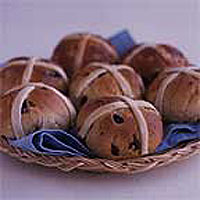 Brush the risen buns with the sugar solution and top each with a cross. Bake for 15 minutes until nicely browned. Cool on a wire rack, then glaze again with the sugar solution. Serve split and toasted, with butter.